When the sun goes down, the Freaks come out and who is more freakish than the evil and disturbed Timothy Plazma. Plazma began his Keystone career as a member of the Army of Darkness led by the equally as evil Jake Saint. 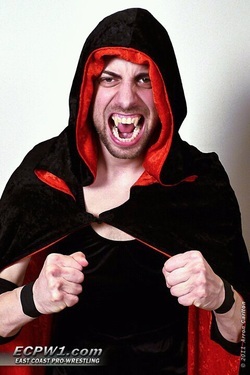 After the Army folded, Plazma kept his ties with Saint strong and eventually joined Saint in the Dark Horsemen along with the Suicide King and Justin Blackwell. Plazma captured the Keystone State Tag Titles with Saint when they defeated Frankie and Jr Flow and held the titles for several months until Better Than You dethrowned the duo in April 2011. Plazma and the Dark Horsemen still reign over Keystone and with the Horsemen on his side, nothing may be able to stop this freakish Keystone star from shining bright. On November 24th 2012, Plazma and the rest of the Horsemen were fired by Jake Saint thus ending the Horsemen Stable.